The Caps finish on top. Chicago makes a comeback. The Rangers climb quickly and the Blue Jackets stink it up! Rest players? Yes. Coast to the finish? No way! The Caps have won five straight and will look to continue that momentum into the playoffs. 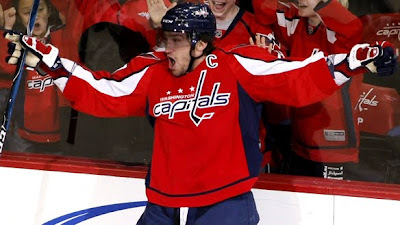 Just last night, Ovi moved into the lead for the Art Ross and the Ricard. To some there is still something to play for. After floundering for a month the Hawks have stormed back to take the top seed in the West. There is one game left to go, but Chicago has control of it's own destiny. Should Chicago win over Detroit in regulation, they avoid having to face them in round one, and increase the likelihood that San Jose win have to. Detroit lost a pair over the last weekend, but bounced back with back to back victories over Columbus. Once in serious danger of missing the playoffs altogether, the Wings have a chance to finish as high as fifth, but no lower than seventh in the West. After a short skid, the Coyotes have won three in a row and have clinched home ice in round one of the post-season. Also during the streak, Captain Shane Doan snapped a long goal drought than spanned nearly one million games! ...well, almost that many. The Sharks have won three of four in April and still have a shot at the top spot in the West. They need to win their final game and get a little help from Detroit. Joe Thornton is back and scored in a win over Vancouver on Thursday. Vancouver clinched the Northwest Division title with a win over Minnesota last Sunday. Good. Then lost both games since. Not good. Confidence can be a fickle friend entering the playoffs. They have one more game to build a positive vibe; and a last opportunity for Henrik Sedin to win the Art Ross. Despite their recent struggles Pittsburgh still has hopes for a division title, an Art Ross and Richard trophy for Sidney Crosby and avoid having to play a surging Ottawa squad in round one. The Penguins close out with games against Atlanta and the Isles this weekend. The Devils have not been sharp for nearly a month, but thanks to a little someone named Marty Brodeur, they can count on regular shut outs to offset their inability to score goals. Brodeur keeps adding to his records, as he registered a pair of shut outs in April and recorded his 600th career win! Buffalo won the Northeast title and placed a giant dent into New York's playoff hopes by beating the Rangers on Tuesday. Yet, it was the Sabres' only victory so far in April. Their last game against New Jersey hold great significance, as it's outcome may determine if they can take the number two seed in the East, and also who wins the Atlantic Division. The Predators clinched their playoff spot with a win over Detroit last Saturday, but where they are seeded is still to be decided. Pekka Rinne was on a roll until Phoenix disrupted him by scoring four times on Wednesday. The Senators were on another hot streak before the Islanders and Lightning defeated them in two of their last three games. More bad news for the Sens: Alex Kovalev tore his ACL and will miss the entire playoff season. Is this the beginning of another streak of losses? The Kings have a pair of wins and a pair of shoot out losses in April. Those precious points gained have kept them in contention for a playoff seed as high as fifth. They will need to win their final two to be assured of the highest seed available, but with Edmonton and Colorado left to play, L.A. will have to work for it. The Rangers are still in it. A do or die game awaits them in Philadelphia on Sunday. Does it get any better? To get to this position, the Rangers had to play some pretty good hockey and they have not disappointed. Lundqvist has played like himself again, and he is also getting offensive support. Like the Rangers, the Bruins have played quite well down the stretch. Today they were rewarded for their efforts. In a 4-2 victory over Carolina, Boston scored a NHL record three short handed goals on the same PK and clinched a playoff berth. With one more game remaining, the Bruins have a chance spoil Ovi's trophy parade. The Avs were not even supposed to be here, so the fact that they are a playoff team is still quite amazing. Despite the fact that they are limping to the finish, Colorado is very young and full of energy players... they may be too inexperienced for an extended run, but they just may be ignorant enough not to know better, and burn a higher seed. With back to back loses to the Isles and Canes, Montreal has one last shot Saturday to clinch a post-season berth with a win over arch-rival Toronto. The three goals scored in their last three games... all loses, are indicative of Calgary's struggle for entire season: There is just not enough there. '09-'10 has been a big, fat, ugly failure. The Blues stayed in it for as long as they could... next year we suppose, but not for Keith Tkachuk, who announced his retirement this week. Fittingly, the Blues rallied behind their departing star and won their final home game of the season against Anaheim. Tkachuk took a victory lap, along with his family after the game. It's over for Carolina. Oh what could have been. It could have been a total disaster, but the Canes proved that this team was full of pride and fought hard after an embarrassing start. The Ducks look wounded after their hot streak ended in March. Anaheim is another team that must surely be disappointed after an arduous season that turned out much differently than expected. Ducks fans may have to say goodbye to stars Teemu Selanne and Scott Niedermayer, and hope that someone can step into their cavernously large skates to rebound next season. The Isles have had some fun playing spoiler for the last two weeks. They have interfered with the hopes of Philadelphia and Montreal; and have the opportunity to decide who wins their very own Atlantic Division crown as the play New Jersey and Pittsburgh to close out the season. The Flyers looked like a sure thing a few weeks ago, but what a predicament they find themselves in today! The good news is that they have Jeff Carter back in the lineup and they have not been eliminated yet... Funny thing is, no matter how poorly they have played as of late, front runners New Jersey and Washington are hoping that they don't have to play them! With nothing left to play for as a team, Mike Modano had a goal and an assist in regulation in possibly his final home game with the Stars, before he scored the shootout winner to beat the Anaheim on Thursday night. Modano will seriously consider retirement when the season is over. Of all the remaining playoff contenders in the East, Atlanta easily had the most difficult road to travel. There is no shame in losing to Washington, New Jersey and Pittsburgh, but it will not offset the disappoinment in missing the playoffs yet again. No Kovalchuk, no playoffs, no fans = no reason to stay in Atlanta??? Not involved in much lately, the Wild's play reflected their lack of meaningful games. Minnesota had lost for straight before their shoot out victory in Calgary. The Wild also won the chance to host the 2011 Entry Draft... so they have that going for them! The Panthers season has been a true roller coaster. Florida management braced fans for big changes that never materialized so their off-season should shape up to something interesting. Up first though: The Florida State Championships. Panthers- Lightning two game show down for the last two games of the season! Woo Hoo! The thud you heard was the collective jaw drop of every Leafs fan when they realized that their team would not be able to prevent Boston from using their 2010 Draft selection for the second best chance of landing the top pick of the draft. The Leafs have lost three straight, but have a shot at wrecking the season for Montreal! What happened to the defense? Steve Stamkos is in contention for the Rocket Richard Trophy and everyone is pitching in to help him, by apparently playing full time with an empty net. Sixteen goals against in their last three games! In the playoffs last season... Hockey in a college town was a success, right? The Jackets closed out the season with a stink, stank, stunk effort that would make the Grinch envious. Five games in April. Five losses.